"We are proud to be a law firm built on referrals from satisfied clients and would like to thank you for referring your family and friends to our office." Michael A. De Vito, Esq. The Law Office of Michael A. 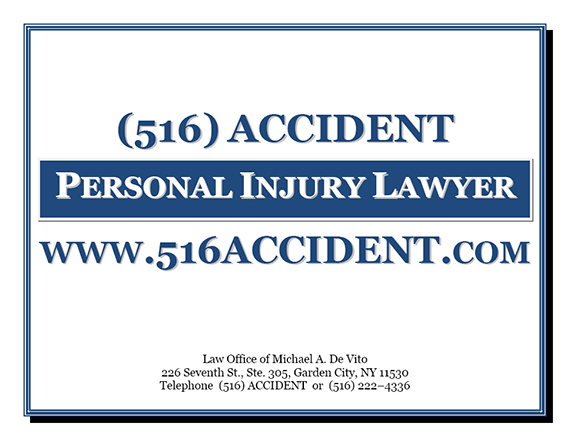 De Vito is a personal injury law firm located in Garden City, New York. The firm represents accident victims who have been injured by the negligent, careless, reckless and/or intentional actions of others. We have and continue to represent clients throughout New York State including Long Island (Nassau & Suffolk Counties) and New York City (New York, Kings, Queens, Bronx & Richmond Counties). If you’ve been injured in any type of accident, we will fight to maximize a monetary award for you. Under the law, you are entitled to monetary compensation for your related pain, suffering, lost earnings, lost benefits and medical expenses. Please tour our website to learn more about our firm and how we can be of assistance to you as your accident lawyer. Please visit our "Testimonials" page to read what our former clients have written about their experience with our office. Feel free to call (516) 222-4336 or e-mail info@mdevito.com, 24 hours per day, 7 days per week, for a FREE CONSULTATION.